This was an enjoyable and easy read that follows the story of 79 year old Grace as she leaves behind her life as a hoarder and begins to enjoy life again, despite the best intentions of her son who just seems more interested in pound signs than the welfare of his own mother! Grace never found the way she lived a problem. Yes she couldn't reach certain parts of rooms as they were covered in clutter, and yes there was a smell, but her home was her safe place, where she led a very simple life since losing her beloved husband. A friend would bring shopping in for her and she made do with what she had. But when disaster strikes she is forced to move into a care home for a couple of weeks, and breaking out of this routine seem to set her off on an amazing journey to meet new friends and have new experiences. Life begins at 79 it seems! 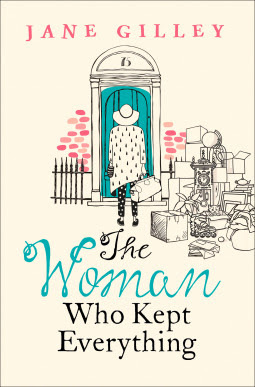 This book does look at the issue of extreme hoarding and depression and it was sensitively portrayed, although I did feel at times it was a little rushed in how quickly it all seemed to get out of her system. She then met others who had the same issue and she was the right person to help them understand how they were living wasn't helping them, and showed a touching and caring side that many who choose to live this way are just lonely and how the presence of friends or family can help them move on and escape this sadness. I loved Grace and how she took to her new way of living so well! She was out to have a good time, and she did! Her son wasn't a pleasant character at all and just highlighted the sadness of those people in the world that can just give up on elderly relatives - until there is money to be had. I think the ending fell a little flat for me with so much happening so quickly but I did enjoy this book overall and it was a story that did well in its' portrayal of a woman who had suffered for so long but managed to get her happy ending! My thanks to Netgalley and the publisher for the e-cop in return for a fair and honest review.